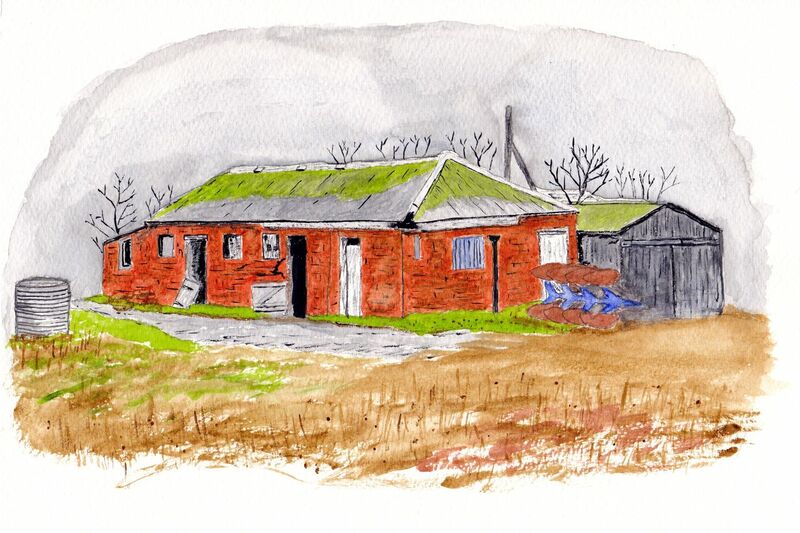 I photographed this old farm outbuilding whilst on a cycle ride out on the fenland and later produced this watercolour. It was a tumbledown disused place next to an old barn. I went by there not so long ago and discovered that along with the barn, it had been completely demolished. neat! I esp. like your handling of the brick work. I'm not quite sure what it was actually used for originally. They may have kept the odd cow or a few pigs in some parts of it, many years ago though. It was certainly a wreck when I checked it out. I like the moss on the corrugated iron roof. Thanks Sweff, I'm glad it was recognisable. That's great Roy. Now that place will have a history without being forgotten forever! Hey Roy...I've seen many sites like that and they always wonder what it was like when it was in use!! I particularly like the end building> I like the look of natural weathered wood and you did good capturing that look. Hey GG, thanks. Its a plough that fixes on the hydraulic arms of a tractor. The blue is the metal part and the eight brown things are the blades/shears. ...it's a lovely painting. You've preserved its memory even if it has been demolished. :-) I'm going to be struggling to get mine too! Wonderful! You really do a nice job with all the details.